It isn’t often that you marry a guy you don’t like, but this didn’t stop our Sealed With A Kiss bride Amanda from becoming Mrs. Micah LeMon. Amanda had been working at the Blue Light Grill on the Downtown Mall in Charlottesville when she first met Micah, and it certainly wasn’t love at first sight. Micah was in charge of making a few changes to the restaurant, and at first she didn’t like the changes or Micah. After getting to know him, however, she grew to admire him and his work ethic, and and she finally saw him for the good guy he was. They began flirting, which led to dating, and slowly her love for him grew strong. Amanda told us about one of her favorite dates with Micah where they visited three different watering holes, went on a hike, and then ended the day at McGrady’s Irish Pub, where they would later have their wedding reception. She decided that he was the smartest and sweetest guy she knew, which made her excited and a bit scared. Amanda didn’t see the proposal coming. She knew Micah was planning an extremely romantic outing for the two of them, and when she mentioned the plans to a friend this friend insisted that Micah was likely planning to propose, but Amanda just didn’t believe it. Then day of the special and romantic date arrived. Amanda and Micah had a tasting at Clifton Inn and then were having a nightcap. Out of nowhere, Micah dropped down on one knee and pulled out an engagement ring. Amanda was so stunned that she couldn’t process what was happening right away. When Micah saw Amanda’s face, he actually stood back up to make sure Amanda was alright and that nothing was wrong. Once Amanda finally registered what was happening, she began jumping around and asking if what was happening was real; she was so incredibly and unbelievably happy. Earlier, Micah had stashed a bottle of champagne outside, and once Amanda said yes he retrieved the bottle and he and Amanda toasted to their new life together. We loved working with Amanda; she was very fun and easy to work with and knew what she was looking for when she walked into our store. Stay fun Amanda, and congratulations on your beautiful wedding, as well as your beautiful dress! Ask Pat: It’s only four months until my wedding day, is it too late to order a wedding dress? Dear Pat: My fiance and I just moved up our wedding date and now it’s just four months away–but I just learned that dresses can take nine months to come in! Is it too late for me to order a wedding gown? How difficult will it be to find a dress in my time frame? Don’t worry! Finding a dress is still a possibility. Some designers offer rush ordering options (keep in mind fees for this can range in price from $50-$500), but your ideal solution will be to find a dress “off the rack”- usually the sample dress brides use to try on. When you make your appointments be sure to ask the bridal salons what sample sizes they have available–some stores carry a range of sizes while others carry all size 8’s or 10’s, and you want to be sure that the sample you buy can be altered to fit you. If the dress you love is a few sizes to big or too small it can often still be altered to fit, but you may need to pay more in alterations. Most stores keep their samples in pristine condition, but if there happens to be a stain or broken zipper on the dress you love, don’t let that deter you–once you have the gown cleaned and meet with a seamstress, the gown often looks like new! Today’s post is all about illusion necklines! You can find them on all sorts of styles and silhouettes, and they add a touch of romance to the wedding day look. Here are 6 of our favorite illusion neckline styles from designers we carry. This gown from Augusta Jones features a lacy boatneck illusion top with a ruched waistline and a flowy a-line skirt. Brides will love the effortless elegance of this gown. Another relaxed yet elegant look is this fitted style by Justin Alexander. It features a Sabrina neckline and delicate chantilly lace. The v-neck on the back of the gown adds a wow factor to this look. 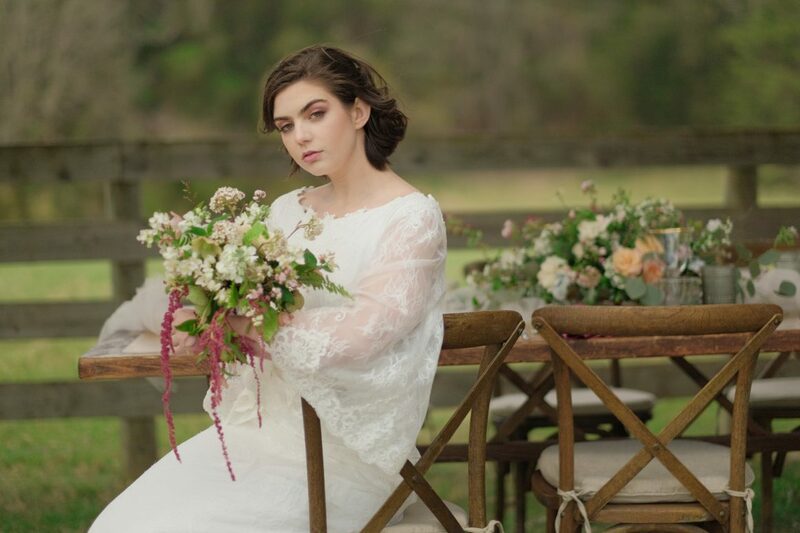 This timeless design from Modern Trousseau has a bateau neckline and small cap sleeves, covered in delicate alencon lace. Layers of French tulle in the skirt finish off this classic and romantic look. Illusion necklines don’t just come in the lace variety! This glamorous style from Justin Alexander Signature features a heavily beaded illusion scoop neckline (as well as a beaded illusion back). Look closely and you’ll see that jeweled and fabric buttons trail down the back of the gown, adding an extra touch of drama to the look. If beading isn’t your style but you still want a show stopping look, this gown from Augusta Jones may be perfect for you! This off the shoulder gown features a lace scallop on the illusion neckline and a flattering fit. Thinking a ball gown may be more your style? Then take a look at this stunning style from Justin Alexander. This gown has embroidered and corded lace through the Sabrina neckline, illusion back and bodice. It’s sure to be a show-stopper!